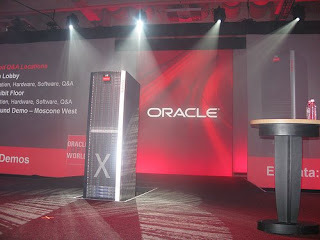 An eXadata Server (officially known as the HP Oracle Exadata Programmable Storage Server) contains 2 processors with 8 cores each, 12 disks, Enterprise Linux and - and this is the coolest part - Parallel Query processing capability for every disk. By bringing processing capability close to the storage, the amount of data going through the wires from a storage server to a database server is dramatically reduced - because results are passed instead of datablocks. Because of this architecure the performance will remain the same as the database is growing - just add some more servers and it will be fine. So this is the last piece of the grid-puzzle: Next to Fusion Middleware grid and Database Grid, Oracle can provide us now with Storage Grid. The performance of this thing is gigantic: tests proved that queries will run 10 to 50 (!) times faster than on current available hardware. And now ofcourse the closing question: What does it cost? A Database Machine costs $650,000 - which is $4,000 per terabyte, and that is much cheaper than other storage around. Apart from that there is 'some' license involved for the software : $1,680,000 (and surely an annual fee of 15% of that amount). So it's not for free...but it can replace a room full of yout current hardware!